Celtic discovered Bayern Munich are still very much a European force as the Hoops suffered a 3-0 drubbing in their Champions League clash at the Allianz Arena. 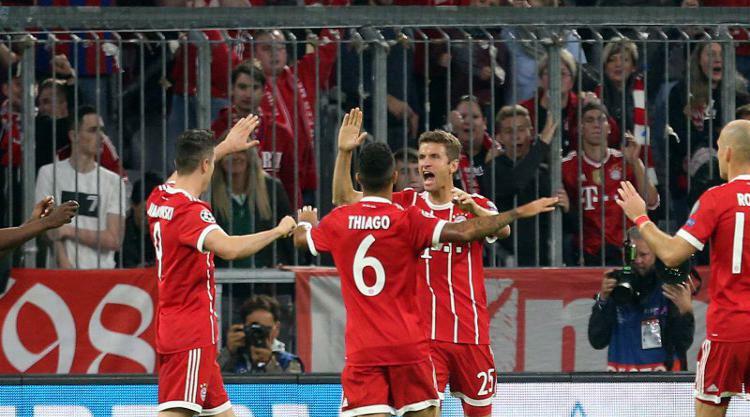 The German giants had replaced Carlo Ancelotti with Jupp Heynckes following their 3-0 Group B defeat by Paris St Germain last month but any thoughts of demise were swept away as skipper Thomas Muller opened the scoring in the 17th minute before right-back Joshua Kimmich nodded in a second before half-time. Mats Hummels headed in a third six minutes after the break and the Bundesliga champions were unfortunate their dominance was not properly reflected in the scoreline. More than a few Scottish Premiership players not feeling any sympathy for Celtic at all tonight! Costa Rica right-back Cristuan Gamboa started only his second Celtic game of the season due to Jozo Simunovoc’s injury and Coman took full advantage. The speedy France winger turned the Hoops defender inside out and was a constant threat to the Hoops’ defence. Coman, 21, looked a class act before he was replaced by James Rodriguez. Celtic goalkeeper Craig Gordon had helped keep Bayern at bay at times during a difficult night for the Scottish champions. The Scotland number one denied Robert Lewandowski on at least three occasions but his added-time save from the Poland striker’s close-range header was world class. Boss Brendan Rodgers wanted his side to play ‘the Celtic way’ against the German giants but they found themselves on the back foot for most of the game. It must have been a frustrating night for the Northern Irishman as he struggled to find a way to contain a very good and star-studded Bayern side. Veteran Heynckes, back in charge of Bayern for the fourth time, has won his first two games with a combined score of 8-0. Bayern Munich: Sven Ulreich 7, Joshua Kimmich 8, Mats Hummels 7, Jerome Boateng 7, David Alaba 7, Thiago Alcantara 7, Sebastian Rudy 6, Arjen Robben 7, Thomas Muller 8, Kingsley Coman 8, Robert Lewandowski 8. Substitutes: James Rodriguez (for Coman, 77) 6, Arturo Vidal (for Thiago, 67) 6, Rafinha (for Kimmich, 79) 7. Celtic: Craig Gordon 8, Cristian Gamboa 5, Mikael Lustig 7, Dedryck Boyata 6, Kieran Tierney 6, Scott Brown 6, Olivier Ntcham 5, Patrick Roberts 7, Scott Sinclair 6, Stuart Armstrong 6, Leigh Griffiths 5. Substitutes: Moussa Dembele (for Griffiths, 64) 5, Tom Rogic (for Armstrong, 64) 6, James Forrest (on for Roberts, 78) 7. Celtic v Hibernian, Betfred Cup, Saturday, October 21. Hamburg v Bayern, Bundesliga, Saturday, October 21.